Every Black Friday, we see phone carriers giving out “free” phones as their blockbuster deals. It sounds like a great deal, right? The truth is, it is never a good deal, unless you have the need to add new lines to your plan. You may ask why? Simply put: new line activation + contract. With these “free” phone deals, you have to add 1 or even 2 new lines depending on the specific deal, and pay for those lines for at least 24 months, if not more. If you are like me, who doesn’t have the need to add new lines, you are better off buying a phone outright, and then bring it to your network. Now let’s look at two specific ongoing deals from T-Mobile and AT&T. T-mobile gives you a free iPhone XR, but you have to do these three things listed above. In addition to trading in a phone, signing up for 2 lines, you need to keep these 2 lines open for 36 moths, so you can qualify for T-Mobile’s monthly credit of $20.8 ($750/36) to make your phone free. If you don’t have the need of 2 new lines, stay away from this deal, because it will end up costing you close to $1,500. With $20/line/month on the T-Mobile One Plan, that’s $1,440 in 36 month for 2 lines. If you don’t have the need of 2 new lines, you can buy 2 iPhones outright with $1,500. What if you cancel these 2 new lines before 36 months to save money? Then the “free” phone isn’t free anymore, as the remaining cost of the “free” phone becomes due immediately. For example, you cancel these 2 new lines 12 months in (24 months left), your “free” phone has a remainder of $499.2 ($20.8 x 24), you need to then cough up the entire payment, because you are no longer eligible for the credit. The AT&T deal, in reality, is a 30-month contract, though a much better deal than the deal T-Mobile offers. It requires only 1 new line, 30 months instead of 36. The downside is that, you need to pay more upfront, because you need to pay for the first one at full cost. If you don’t have the need of a new line, stay away from this deal as well. With $30/line/month, you will end up paying $900 (before tax) in 36 month. If you don’t this new line, you are better off buying the phone outright for $750. Just like the T-Mobile deal, if you decide to cancel the new line before 30 months, you will have to pay up the reminder of the cost on the “free” phone. If you don’t need to add new lines to your plan, it’s always cheaper to buy a phone out right (in our example $750 for an iPhone XR), because you avoid paying for unneeded new lines for years. Here is a direct cost comparison. If you don’t need new lines, you will end up saving +$1,000, by buying one with cash outright. If you don’t need new lines, when you buy a new iPhone out right, you save on 4 areas. You don’t pay for additional lines you don’t need. You don’t need to trade in another phone. You don’t pay for activation fees. You don’t need to wait for 3 years or 30 months to get your full credit. If you are in need of new lines, your situation changes, as you are comparing the deals to a new phone + signing up for new lines, because you have to. If this is your case, you should go with these deals. 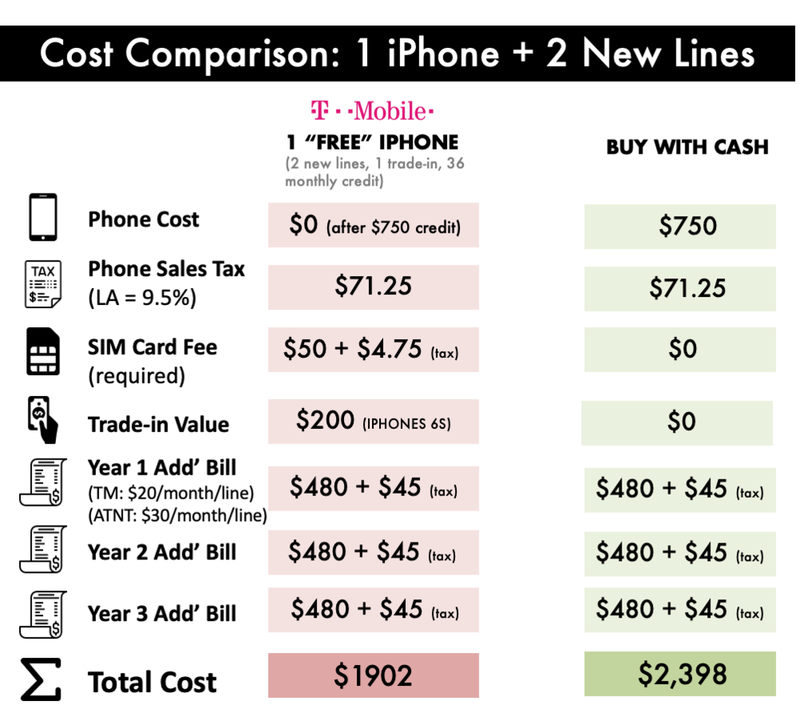 Here is a direct cost comparison for a person needing a new phone and 2 new lines. You can see, the T-Mobile deals is cheaper by $400 at the end of the day. Here is a direct cost comparison for a person needing 2 new phones and 1 new line. You can see, the AT&T deals is cheaper by $750, exactly the cost of a free Iphone XR. There’s no such thing as a “free” phone. Phone carriers charge you in other ways, particularly through adding new lines and forcing you to pay for these lines for 2-3 years, through the tactical of monthly billing credit. If you don’t have the need to add new lines to your phone plan, stay away from the free phone deal, as it will cost you way $1,000 more than buying a phone outright, because you will be paying these unnecessary lines for years to come. If you are genuinely in need to add people to your plan, these deals are good, because, out of necessity, you would’ve paid for those added lines anyway.